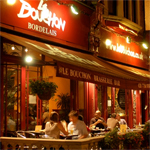 Le Bouchon is the tour de force in authentic French cooking. Set up in 1986 by Ian Stoppani and Bruno Laurent, it has been a stronghold for expats and those looking for the unadulterated French Brasserie experience. Unfortunately service leaves room for improvement. Ordered red wine was brought white wine, being offered other people's food. Ordered Coconut Sorbet with malibu, being offered Lemon Sorbet instead...No in a rush to go back!